It's Back to School time!!! I know I am not technically going back to school but I have clients and friends who are, so I always like to think about what the best pieces are to invest in for this time of year. I follow trends and merchandise in the stores at Summit Fair and I try to be very in tuned with what is selling and what the stores are focused on featuring in the store front windows. It's actually one of my favorite parts of my job as a stylist and wardrobe consultant. I find it kind of fascinating to research and observe the fashion styles that people gravitate towards and what trend experts are predicting to be on the "It List" for each season. The transition from summer vaca style to a more sophisticated "back in the routine of life" kind of style can be tricky sometimes, especially for those young adults transitioning into new schools, new jobs, internships, and college. Life changes and new "school years" are often times when it gets tough to figure out your signature style and also buy things that will be practical and worth the investment. I like to focus on transitional pieces with great fit and quality. Once you have a good base wardrobe with those items then you can sprinkle in a few trendy pieces and some of those "It Items" like a maroon bootie, a color block bag, and some statement scarves. Play to win 2 ways! 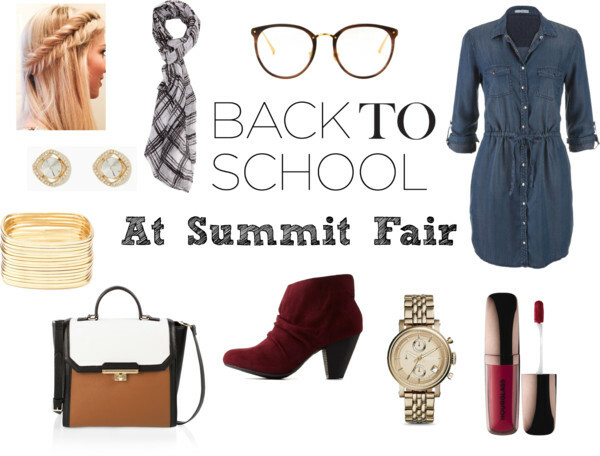 Instagram: Follow Summit Fair, Share, an original photo or this image, Tag @SummitFair Hashtag #BacktoSchoolatSummitFair **show us or tell us one item you would buy from one of the stores at Summit Fair if you won the Back to School Giftcard: (1) $500 gift card winner through instagram. In-Store: Entry boxes available. For every $100 purchase you are entered to win 1 of (4) $500.00 gift cards for Back to School Shopping at Summit Fair during the promotion!